A Dewback is an animal from the Classic Star Wars theme which could be trained and ridden on, they were commonly found in the Dune Seas of the planet Tatooine. 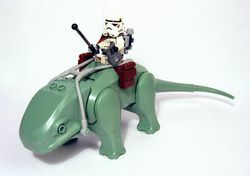 Imperial Sandtroopers on this planet were trained to ride Dewbacks for scouting and mounted combat. Dewbacks were omnivorous animals, originating on Tatooine. They were popularly used by Imperial soldiers for travel, scouting and battle. They were about 2 or 3 meters long. This page was last edited on 9 July 2016, at 09:36.